I do have a soft spot for the Sega Master System, and I still have one always within arm's reach. 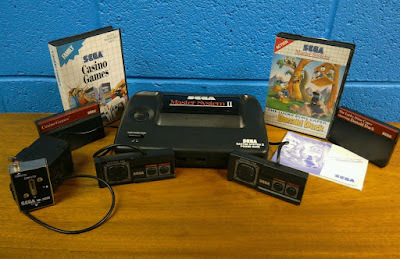 Sega's humble 8-bit console, you see, besides being the only console that managed to survive among Europe's home computer driven gaming market of the 1980s, had many excellent games released for it, allowed for some impressive for the era graphics, and was modestly priced. Happily, the machine remains modestly priced to this very day, and you can grab one via this Sega Master System eBay auction. It is the more compact mk. 2 version of the console you'll be bidding on, and it comes with its cables, two controllers, and two boxed games (Donald Duck: The Lucky Dimed Caper, Casino Games). The built-in game is Alex Kidd In Miracle World. Seller ships only within the UK.